Just weeks before the 2010 Sugar Bowl, it was announced that 5 Ohio State football players college eligibility was in jeopardy because of selling their property (that they lawfully earned), in violation of NCAA rules. Eventually the student-athletes were allowed to play in the Sugar Bowl, but were suspended 5 out 12 scheduled 2011 games (40% of the season) after they were publically extorted by their coach, Jim Tressel, who forced the players commit to returning to Ohio State for the 2011 season so, according to Tressel, the student-athletes wouldn’t “skirt the consequences” by playing in the Sugar Bowl, then declaring for the NFL draft and avoiding any punishment” for their transgressions. Ironically, earlier this week we learned that Tressel knew about the possible rules violations 6 months before it became public, and knowingly and willfully concealed that information despite his contractual duty to report to school officials and the NCAA. He alleges he keep quite because he did not “want to interfere in a federal criminal investigation” and thought that he was “prohibited from doing so because the information was confidential.” BALDERDASH!!! Now it’s not proven that Tressel’s true reason for not fulfilling his duty was because he didn’t want to interfere with his possibilities for almost half-million in bonuses his contract guarantees for milestones his team could not have reached without those 5 suspended players. But it is proven this is not the first time Tressel has been involved in controversies of this nature. While he was head coach at Youngstown State University – Tressel was found to have conducted an incomplete investigation of star quarterback, Ray Isaac, for receiving improper financial benefits. During his tenure at Ohio State, phenom running back Maurice Clarett who helped lead the Buckeyes to a National Championship was suspended by the NCAA in 2003 for receiving improper financial benefits that Clarett maintains came from Tressel himself!!! It seems logical that Tressel, a multi-millionaire coach with a contractual duty to know and report NCAA and institutional rules and track record of previous mis-conduct would at least, receive the same punishment (five game suspension) as his teenage, unpaid student-athletes who may or may not have known it was against the rules to sell their own property. Wrong! So far, Tressel has only be suspended for the 2 out of 12 2011 scheduled games (16% of the season) against traditional doormats Akron and Toledo and fined $250,000 (roughly 7% of his 3.5 million dollar annual salary). So, by far, the more compelling aspect of this story is the blatant double-standard in treatment by universities and the NCAA regarding rules violations by multi-millionaire coaches and so-called student-athletes. For example, last fall University of Tennessee’s head basketball coach, Bruce Pearl, was suspended for 8/31 scheduled games (25% of the season) by the Southeastern Conference for knowingly lying to NCAA officials about hosting recruits and their parents at his own personal residence which he knew was a violation of NCAA Bylaws. So far the NCAA has not punished Pearl at all. Now compare those actions with how the NCAA treats student-athletes. For example, University of Kentucky baseball player, James Paxton, was removed from the team and had his scholarship stripped for refusing to meet with NCAA officials regarding his relationship with attorney and sports agent Scott Boras. Paxton had a lucrative offer to play professionally for the Toronto Blue Jays but instead returned to Kentucky to play for the Wildcats (without any monetary compensation by the way). The NCAA or University of Kentucky never asserted any accusations that Paxton had violated any rules or regulations, they only wanted to discuss his dealings with Boras. Paxton refused to accept the NCAA’s “invitation” to discuss Mr. Boras on grounds that such information was confidential under the attorney-client privilege. The NCAA countered that the NCAA Bylaws superseded Paxton’s constitutional rights to such privilege and that the assertion of such right was seen as non-cooperation!! So, without ever speaking with Paxton and without providing any evidence to support their position, the NCAA ruled Paxton permanently ineligible for violating the NCAA’s “No Agent Rule”. The NCAA sent a clear message that student-athletes are entitled to no due process rights under their Draconian methods of governance. We also have the case of former Oklahoma State University football standout Dez Bryant. Bryant was “invited” to speak with the NCAA regarding his involvement with Deion Sanders and sports agent Eugene Parker and whether or not the two ever acted as his agent during his time at Oklahoma State. During the NCAA’s interrogation of Bryant, he lied to NCAA officials concerning whether or not he had dinner with Sanders. When the NCAA issued its decision it found that Sanders and Parker had not acted as Bryant’s agent, but yet they suspended him for his entire senior season because he lied about having dinner! Of course, lying is never acceptable. But to suspended a suspend a nervous college student because he lied out of fear, ignorance and/or confusion of a rule while being interrogated by professional investigators, for an entire season is ridiculous. Then only suspended wealthy, professional, and represented head coaches for knowingly and willfully lying to NCAA investigators about engaging in activities they knew were not permitted by the for only a hand full of games is just shameful. Do you see the problem?!? 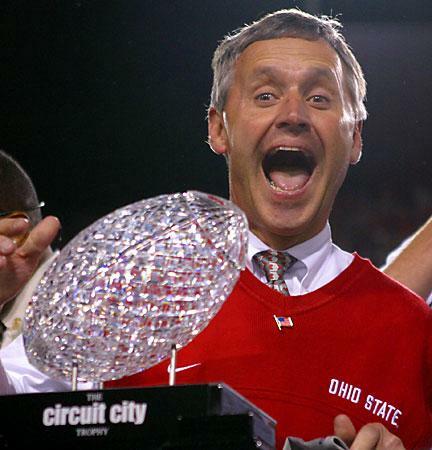 In closing, while this ordeal is embarrassing for Tressel, before any meaningful games are played by Ohio State we’ll see him roaming the sidelines of The Horseshoe in his trademark sweater vest, and his lucrative coaching career will continue as usual. Meanwhile, student-athletes like James Paxton, Dez Bryant, and Ohio State’s Terrel Pryor will forever have their collegiate experience and lives altered for the same or even less offenses. Why we hold young student-athletes to higher standards than the sophisticated head coaches (entrusted with the development of their student-athletes) of major college athletics programs is beyond me. The truly disturbing aspect of this entire story is that there is no end is in sight to such egregious and disappointing conduct on the part of the NCAA and its member institutions.